BLURB: The Troy of myth was a real city and it was called Wilusa. This is its story… Hektor’s life of privilege is forever changed when a man, allegedly possessed by the sun god, inspires revolution among the oppressed people of Wilusa. For Hektor, son of the city’s despotic ruler, social equality contradicts every principle he has been taught. And his obsession with duty is alienating him from his own young son, Hapi, with whom he has a fractured relationship. 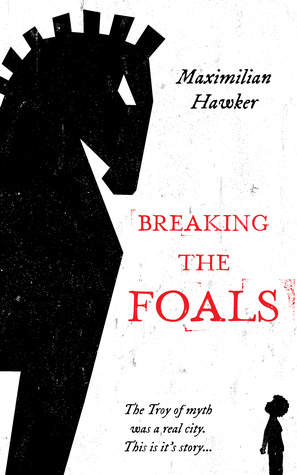 But when Hapi’s life is threatened, Hektor is compelled to question his every belief as he rebuilds his relationship with his child through the breaking of a foal. As Wilusa collapses into political violence and the commoners rise up, Hektor must finally decide whether to defend the people and lose his identity, or remain loyal to his irrational, dangerous father. I don’t remember exactly what triggered my interest as a teenager about Troy, but I do remember checking Schliemann’s book on his Trojan excavations out of the Monteith Branch of the Detroit Public Library. Thus began my lifelong affair with ancient times. When I entered Wayne State University a few years later, I chose Classical Civilization as my area of study and immersed myself in the mythologies and histories of ancient Greece and Rome, including Homer’s Iliad. Since then I’ve read more than a few historical fiction tales of The Trojan War, e.g. Hand of Fire by Judith Starkson, the Odysseus series by Glyn Iliffe, the Ilium and Olympos duo by Dan Simmons. The one common factor in all of them is that they all see the tale from different perspectives; a trait they share with Breaking the Foals. This tale brings to life a Troy that existed prior to the city of Homer. Indeed it is one school of thought that Homer’s Iliad was based on a series of events that happened in this corner of Asia. Wilusa was a Bronze Age vassal to the Hittite Empire at the time of this Priam and Hektor; albeit the more powerful of the various cities in the region. The author has pieced together a marvelous tale integrating the time and tenor of Bronze Age Asia Minor with elements of Homer; elements that are presented in a manner to make them less mythological and more historical. The plot develops around Hektor, the dutiful son and right hand man of Priam, the representative of the Sun God on Earth, and the growing discontent of the populace of the lower town with the “deserving” in the upper town. Hektor finds himself torn about his duties especially as his son, Hapi, is not one of the “deserving” being born to a prostitute mother. The tense atmosphere with the lower town subjects, plus a rather unfortunate set of events; earthquake, a rather unhappy neighboring city, and the general feeling that Priam has lost the favor of the gods lead to an exciting climatic conclusion. The reader is presented with believable characters, wonderful descriptions, and an entertaining telling of a story that is at once familiar yet different enough to rouse the historically curious.